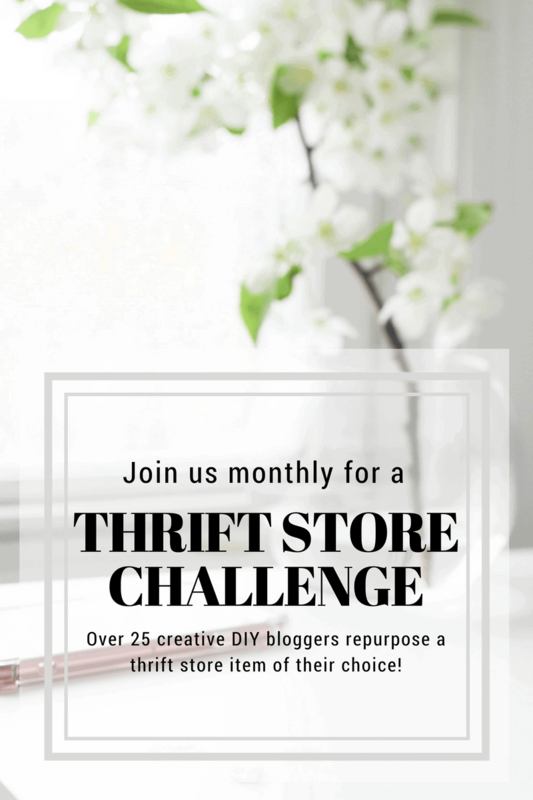 Here we are again for the second Thrift Store Upcyle challenge of 2018. I love these posts. They are so fun. 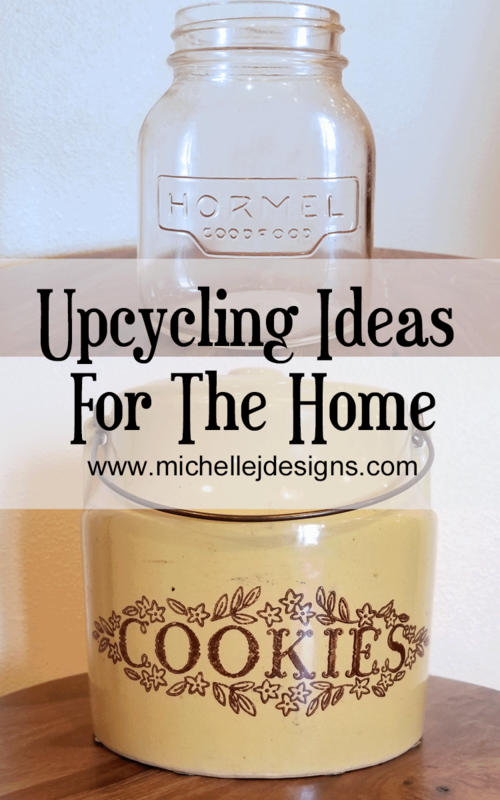 This time I have some farmhouse upcycling ideas for the home. 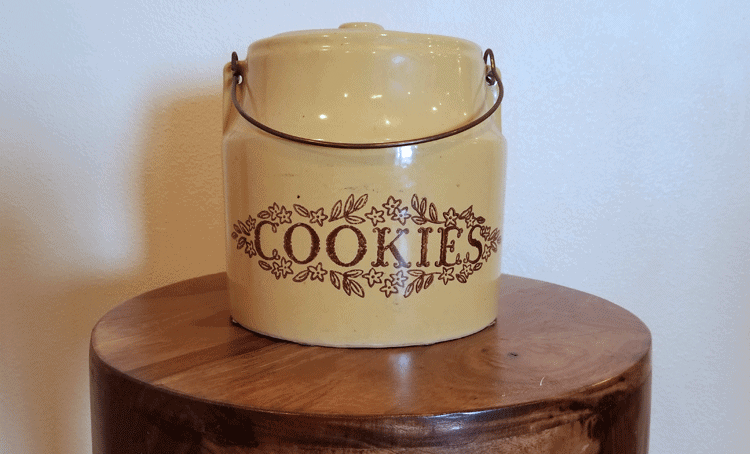 One glass bottle and a cookie jar that I have painted and re-created into useful and fun decor items. Each month we get together to show off our up-cycled, thrift store projects. Thank you to Amanda from Domestically Creative for putting this together. She makes it so easy for the rest of us! 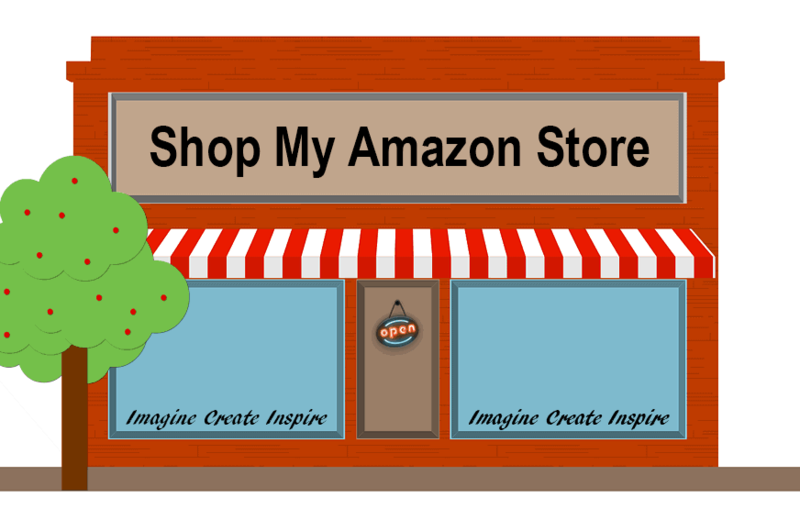 I have added in some affiliate links for your convenience. You can read my full disclosure here. This month I went out to my garage and found two items I had purchased. 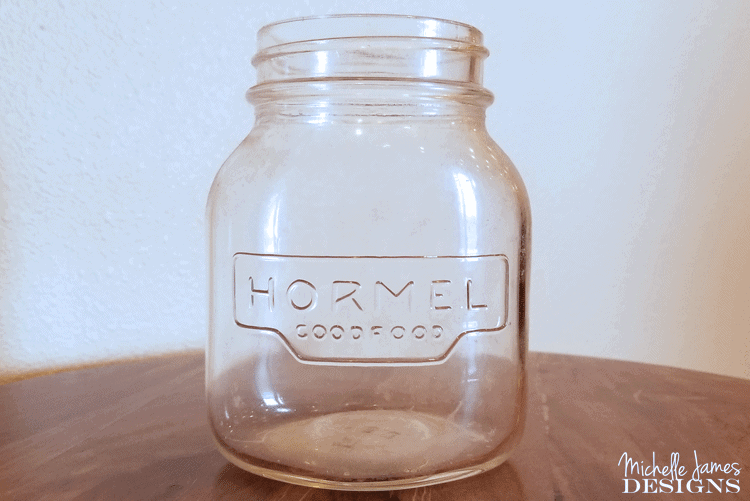 One was a cookie jar and the other is a cute Hormel glass bottle. Here is the before photos. They were full of garage dust. 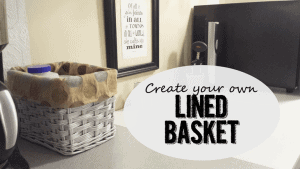 This is a really easy project to make on a snowy weekend when there isn’t much else to do. I used DecorArt products. First was the chalkboard paint and for the small bottle I used the chalky finish for glass and the white color is called Everlasting. I love these products! 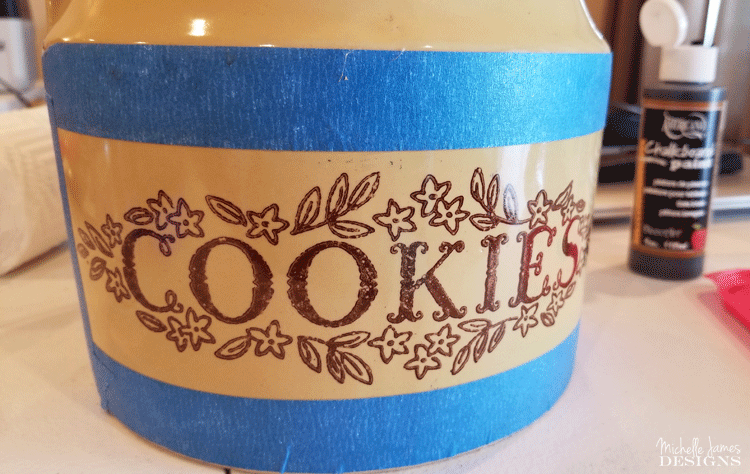 I knew I wanted to hide the “cookies” part of this and chalkboard paint is always great for hiding the bad things. You can see by this post that I have used this technique before. 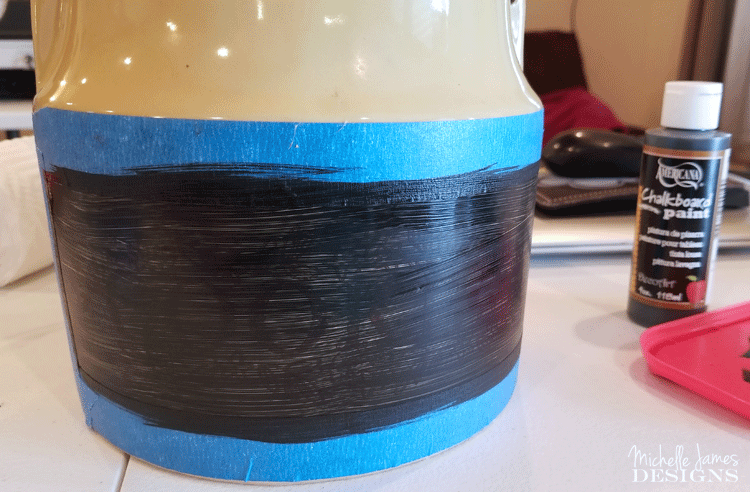 I taped off the area that I wanted to paint and used three coats of the chalkboard paint letting it dry for about an hour in between each coat. This was after one coat of the chalkboard paint. 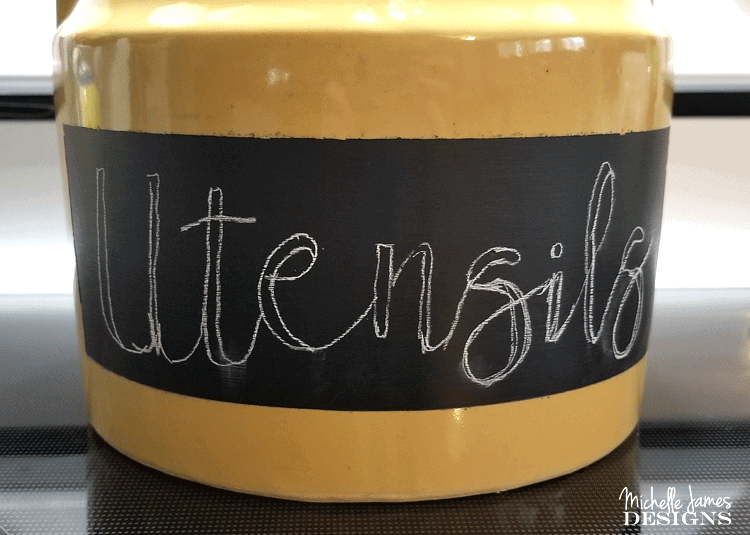 Then I used a chalkboard pencil to create my wording. With a chalkboard marker, I fill it in. Here is the final result! I think it turned out splendidly! And it fits nicely into my kitchen decor. Plus it is much bigger than our old utensil holder and we like having the extra room. I loved this little bottle and I cannot remember where I got it. I think it may have been given to me. The chalky finish for glass was perfect for this because I wanted it to be white. It is perfect with a little distressing too. I followed the instructions for baking just so it would last a little longer and just in case I needed to wash it but it will be used mainly as a vase. I painted three coats of the white (Everlasting) chalky finish paint. This was after the first coat. But after two more coats and a bit of sanding it came out really cute. I love both of my new home decor pieces. 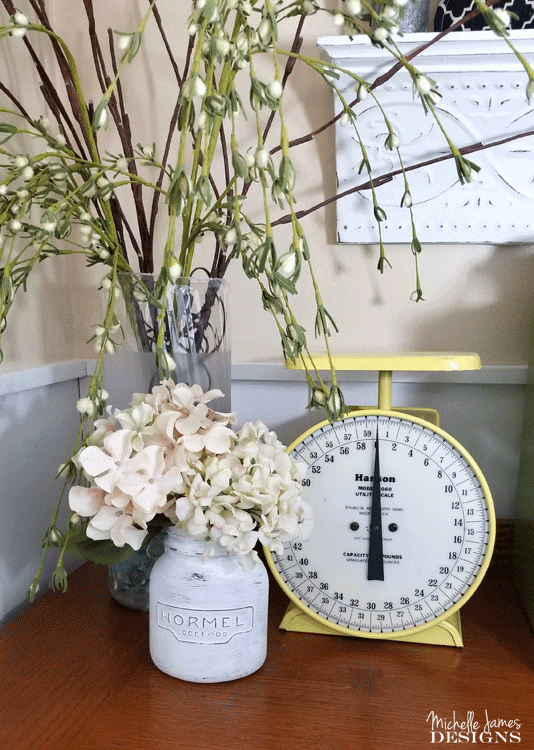 I have had a lot of comments about the fun farmhouse scale next to the bottle. It was so fun. I would love you to head over and read about it too! 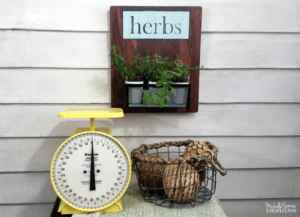 I have other farmhouse upcycling ideas for the home too. Check out my recipe book/table holder, these cute ceramic milk bottles, and this awesome farmer’s market sign. All were upcycled from thrift store or garage sale items. This was another fun post for me. I hope you liked it too. 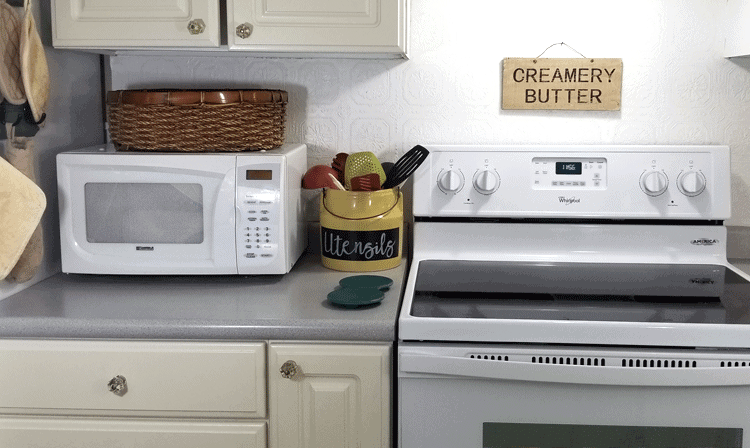 these both look fantastic and fit perfectly in your kitchen. 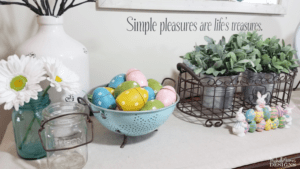 I am remodeling my kitchen to be a farmhouse kitchen so I am pinning this for when im ready to start decorating. Hi Jenny. Thank you so much. Good luck with your remodel. Ours has been about a 5 year process. UGH! We are so close now. Cute, very practical re-purposes. Visiting from Thrift Store Challenge. Thank you Victoria! I love these. I have been very practical with my projects lately. I think I am getting to that point where I really want to have it before I re-do it. LOL! I couldn’t tell if my comment took or not. Love your salvage projects. This is exactly what thrifting and upcycling is about. Thanks so much Deborah! I love these too. 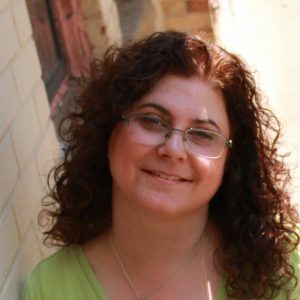 Michelle, you did such a great job! 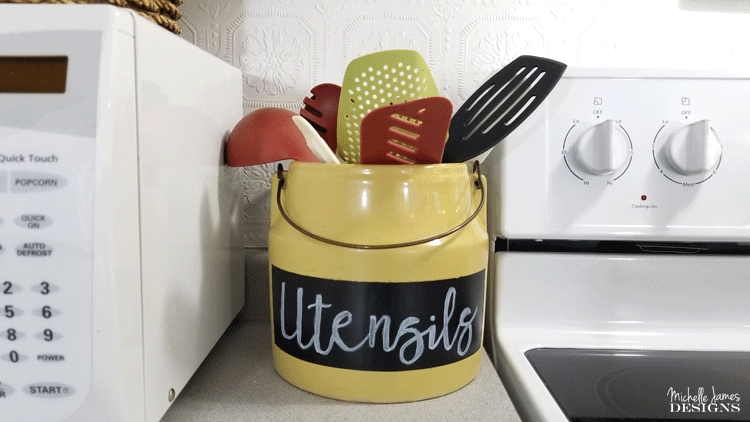 I love your handwriting on the utensils pot. 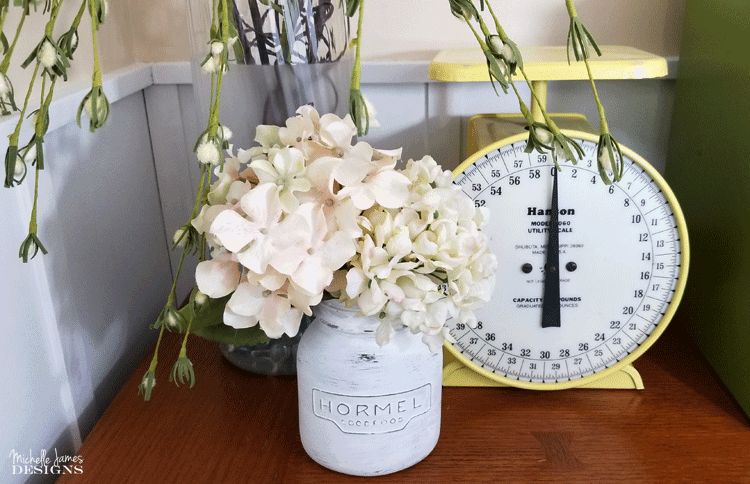 Also I have a huge crush on that yellow scale next to the freshly painted jar. Thanks so much. That scale is one of my favorites too. I love playing with fun fonts. I really think I have an addiction. Thank you Angela. I had fun with these. They were simple but effective! Now I know what to do with “Finds” that have no lids other than turning the writing towards the wall! Great idea! Wish I could find more great bottles! That is funny. I love to cover things up with chalkboard paint. Thanks so much for stopping by! These turned out SO CUTE!! I love it. I love that little scale you have next to it too! Hi Chelsea. I really need to put a link to the scale post. I love it too. I have it out all of the time. The bottle is fun too. LOL! love them both, michelle! What a great idea and ever so farmhouse. I can’t wait to try them out. Thank you Carolann! These were easy peasy. 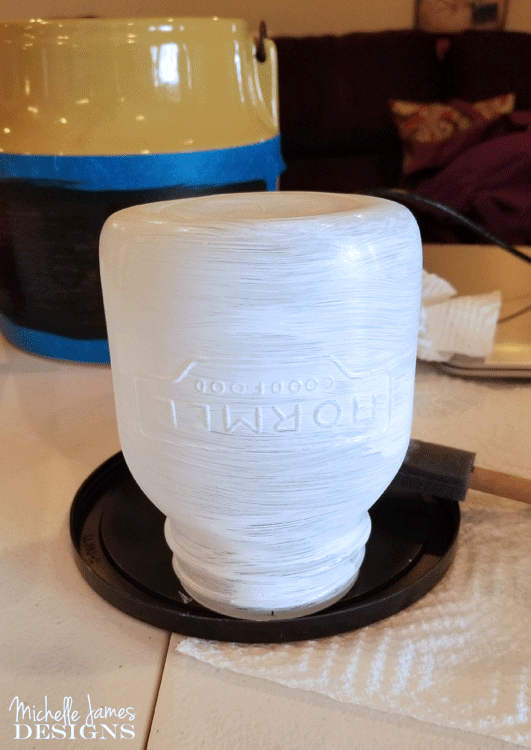 You should try the Chalky Finishes for Glass paint. It is awesome! I will be thinking of you on my next trip to Michaels as i often do when out shopping for craft projects. I love Michaels. Be sure to get something great. These are easy peasy ideas.